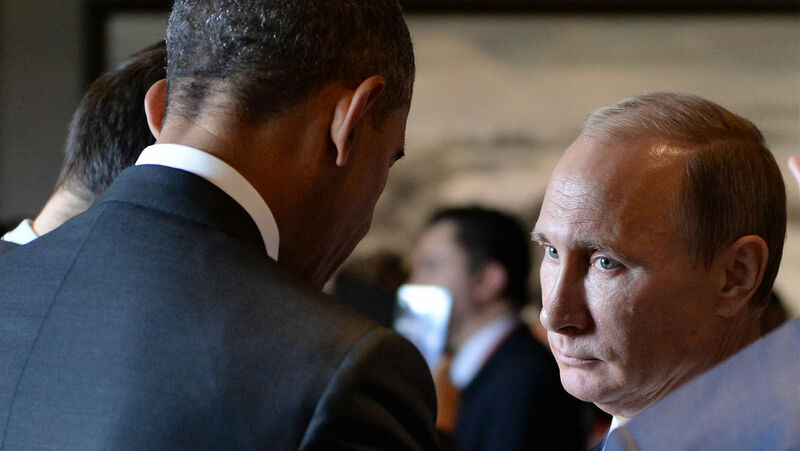 Russian President Vladimir Putin speaks with U.S. President Barack Obama before the Asia-Pacific Economic Cooperation summit in Beijing on Nov. 11, 2014. Why did the Obama administration allow Russian interference in the 2016 presidential elections? Since Donald Trump won his remarkable victory in the November 2016 presidential elections, the Federal Bureau of Investigation has been working hard to investigate him. It is looking for collusion between his campaign and the Russians. For nearly a year, it has found nothing to prove that the Russians helped Trump defeat Hillary Clinton. But Russia did meddle in the United States election—and the Obama administration chose not to stop it. Recently, cnn interviewed Brett Bruen, a former Obama administration official and former director of Global Engagement on the U.S. National Security Council. Two years before the election, Bruen was sounding the alarm about Russia meddling in U.S. elections. He warned that Russia was likely to use the same fake news and social media tactics in America’s elections that it used when interfering in the 2014 Ukraine elections. This is exactly what happened. “I was sitting in the situation room saying, this is something that is going to march across Western Europe, it’s something that is going to march over to our shores, and we need to be ready!” Bruen said. Bruen was addressing the Obama administration in the White House, saying, We need to be ready for an attack! He even proposed a command center to monitor and counter Russian misinformation, but the State Department rejected the advice coming from its own National Security Council! The Obama administration didn’t just allow Russians to interfere with the elections—it enabled them to do so! In Bizpac Review, Kyle Becker wrote: “It was in the heat of the 2016 presidential campaign that Susan Rice proved to be a pivotal figure preventing the United States from countering Russian attempts at election meddling” (March 9; emphasis added throughout). The information in Becker’s article all comes from Russian Roulette: The Inside Story of Putin’s War on America and the Election of Donald Trump, coauthored by David Corn and Michael Isikoff. The book explains why the Obama administration didn’t aggressively resist Russian attempts to meddle in the U.S. election. According to cnn, by the time the July 2016 party conventions rolled around, there were “more than 80 people at the Kremlin-backed Internet research agency already assigned to meddling in American life.” Multiple sources involved in national security told cnn that they didn’t realize the extent of Russia’s meddling at that time. But they shouldn’t have been caught off guard, because Bruen and others had been warning them all along! What was that reason? Why wasn’t the Obama administration concerned about this looming threat? Why didn’t they do anything to stop Russia? It’s because they saw no need to counter Russian interference in the elections—because Hillary Clinton was going to become the next president of the United States! When candidate Trump commented that he might not accept the election results if he thought they were rigged, Democrats in politics and the media heaped scorn on the idea that election results could be tainted. Politicians and media confidently and consistently pushed the message that Hillary Clinton was going to win. On my November 9 Trumpet Daily Radio Show, I played a montage of major media outlets declaring confidently that Donald Trump was headed for a historic defeat, and Hillary Clinton was about to win a landslide victory! In their minds, there was no need to aggressively go after Russia when Hillary was in the lead. But now that President Trump has won the election, the fbi can use accusations of Russian collusion to surveil and probe people and organizations tied to Mr. Trump. Now, the Russian threat is no longer a 1980s relic but suddenly an ever-so-serious matter. Suddenly federal agents and everyday liberals are very concerned about the ins and outs of lawful election proceedings—although from the other side of their mouths they simultaneously scorn President Trump and others for saying that people should not be able to vote illegally. Why this change of heart? Because it’s an excuse to continue investigating Mr. Trump in an attempt to find something that will cripple or end his presidency. The entire Trump-Russia investigation is based on a hoax. Robert Mueller’s team has been searching for evidence of collusion for nearly a year and has found nothing. But what has been revealed is a tremendous amount of lawbreaking by bureaucrats in intelligence and law enforcement! The previous president filled America’s law enforcement agencies with treasonous agents. It is important that you understand the drama unfolding in Washington today. America has never seen a government come under as much attack from its own people as the current administration. Our nation is on the verge of collapse. If you want to understand what is happening to America, I highly recommend that you read my father’s article. He brings clarity to events that you need to understand.